Great here we go again. Bunnyhopping is the simplest method to get up some vertical distance, either up onto something or over something. The limitation of bunnyhopping is that it requires a decent amount of speed, and therefore a larger amount of space to build up that speed. Bunnyhopping, in its simplest terms, is just weight shifting. 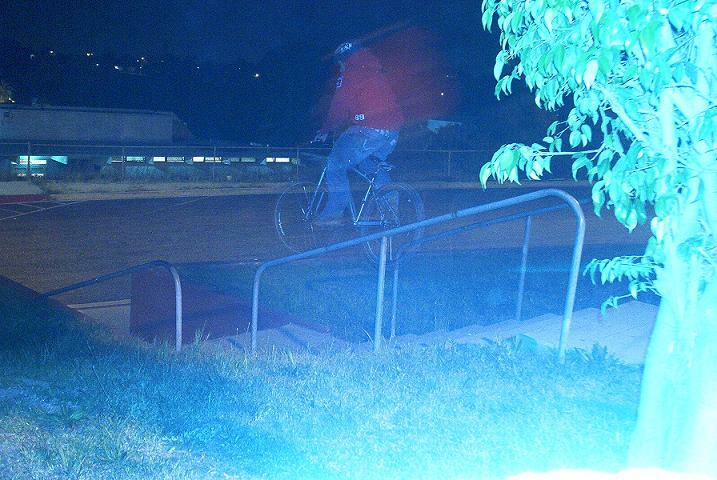 The techniques used to bunnyhop are the same, whether you go five inches or five feet. You just exaggerate more and more to go higher. The best way to learn is to start small; try it on a curb or a 2x4 set on your driveway. Don't try to get up the neighborhood two foot high wall on your first attempt. Roll towards the object at a good pace (for a small object try a quick walking speed). Right before you get to the object, you will want to shift your weight back, unweighting the front wheel. When the front has risen high enough to clear the object, quickly shift your weight forward, while pushing forward with your arms. This will have the effect of leveling the bike out in the air, allowing the rear wheel to clear the object. Try to land relatively flat, with the rear wheel hitting first. It's much better to land with the rear first, landing front first will only lead to uncomfortable situations and unwanted endos. If the object is too large to completely clear, your approach will be slightly different, but the techniques used will be the same. Instead of trying to get all the way over, you need to get high enough that you can land on your bashguard or bashring. Once you hit the object, try to regain your balance with a smll hop or two, and plant your pedal or bashguard to give yourself a break. Soon, you can do this..
Is actualy SMT in the avatar...right SMT...? that'll work....sweet website, thanks for the link!